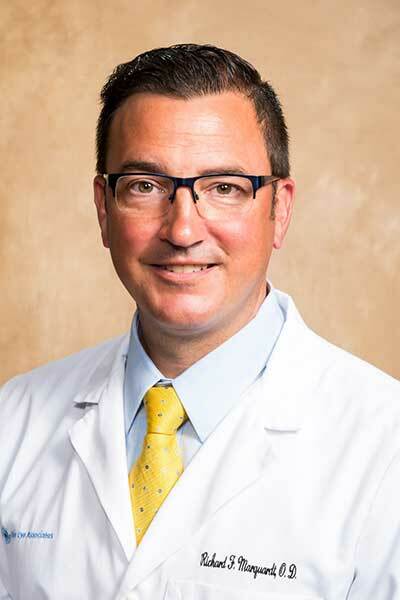 Dr. Richard Marquardt is a certified Optometrist practicing at Ohio Eye Associates since 1997.He holds clinical privileges at Ohio Health Med Central Mansfield and is a member of theclinical faculty at Ohio State University College of Optometry. Dr. Marquardt received his Doctorate of Optometry degree from the Ohio State University College of Optometry in Columbus. Prior to that, he completed his undergraduate degree in Biology from John Carroll University. He has served as Zone Governor for the Ohio Optometric Association and past president of the Ohio State University College of Optometry Alumni and Friends. Currently Dr. Marquardtis on council for the Dean’s Advisory Board for Ohio State University College of Optometry. Dr. Marquardt’s interests include medical management of eye diseases including glaucoma and diabetes. As a native of Richland County, Dr. Marquardt enjoys serving the community of the Mansfieldarea. He spends his spare time skiing and being outdoors with his family.